How far would you go for the one you love? That’s a tagline that’s been tethered to umpteen drama/thriller/crime flicks over the years, where a character is thrust into such a perilous situation that it leaves their significant other with little choice but to maneuver around a series of obstacles – both literal and figurative – to ensure their safety. 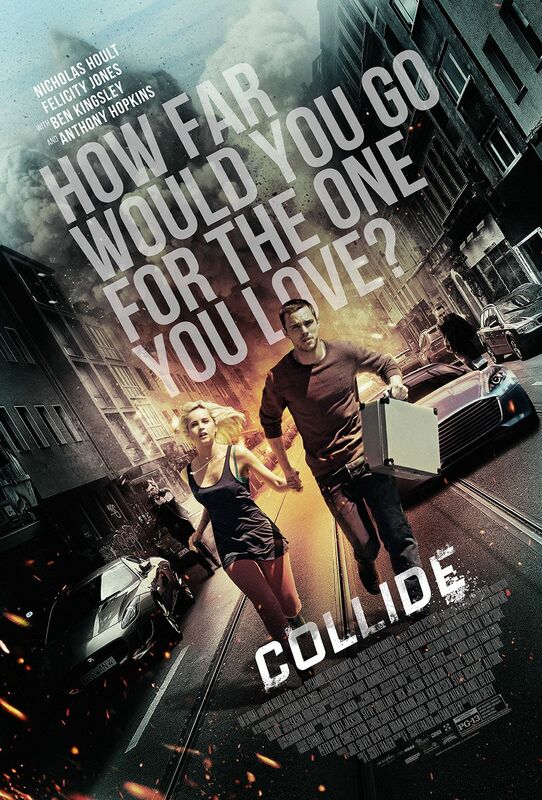 Another movie to hew close to those hackneyed conventions is this summer’s heist movie Collide, an action-packed romp that finds Nicholas Hoult (Mad Max: Fury Road, X-Men: Apocalypse) in the role of Casey Stein, an Average Joe who is ready to risk life and limb to save his ailing girlfriend, Juliette (Felicity Jones). In order to afford those astronomical medical bills for a kidney transplant, Hoult’s protagonist returns to a life he thought was far behind him – smuggling precious cargo for a group of powerful mob bosses. Directed by Eran Creevy (Welcome to the Punch), the by-the-numbers thriller also stars two bona fide acting heavyweights in Ben Kingsley and Anthony Hopkins, with the former playing the role of a crooked gangster who lures Hoult back toward the city’s criminal underbelly. Collide darts into theaters on August 19.